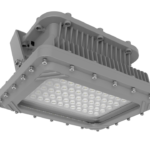 The FEL series LED class 1 Division 2 Flood Light is used in areas that require class 1 divison 2 protection from gasses. The light comes standard with a trunnion mount bracket and 3/4 inch NPT connection for ease of application. The FEL series is ideal for flood lighting mounted inside and outside buildings. Primary applications include: Natural Gas Operations, WWTP plants, Oil and Gas operations / Production, Storage of Chemicals. 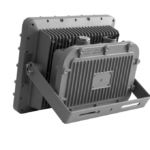 The FEL series LED class 1 div 2 comes in 60 degree spot to 110 degree flood light spread. Equipped with Cree XP G3LED and Constructed of corrosion resistant copper free aluminum body and thermal shock resistant glass for long lasting durability. Operating Temperature -40 c to 60 c. Meets the standard codes for Nema 3 and 4 x , IP66 and UL class 1 Division 2 Groups ABCD. 120/ 277 volt and 480 volt. Available below in 80 watts with 10,400 lumens, 100 watts with 13,000 lumens and 150 watts with 19,500 lumens.